As people age, they tend to lose some teeth. Some get lucky and only lose a couple over the years. Others struggle with tooth loss for a while and end up with no teeth left. Commonly, the advice people were given at that point was to go out and get a set of dentures. They were easy, relatively inexpensive, and worked for the basics of what you needed them to work for. However, today there is a much better option no matter how many teeth you want to replace, and that option is dental implants. When you are looking for a way to keep your mouth working like it used to, then dental implants are the way to go. Your dentist will put a titanium post into your jaw and let it bond with the bone itself. From there, you get an implant of a false tooth (or set of teeth) put on that post. Then, you go about your life. When dentures were commonly used, the jaw did not get the same workout that you do with the posts of dental implants. This would cause the jaw bone to reabsorb and you would see people with a sunken look to their cheeks. This caused people to look older than they really were. Implants, on the other hand, keep the jaw strong. It keeps the face looking youthful, and it allows you to eat just like you did with your original teeth. 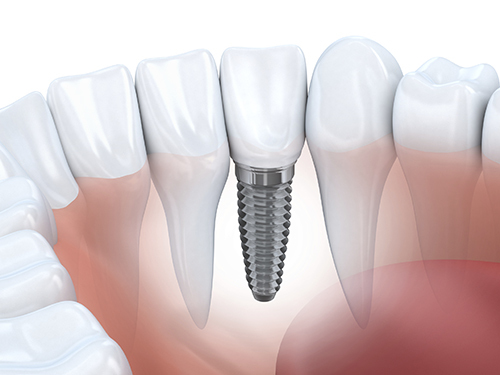 Dental implants are a great option whether you have a single missing tooth, or you only have one tooth left. No matter what you need, dental implants are probably the best way to go. To find out more, go in and consult with your dentist. They can help you decide the best route to fill in any missing gaps you have.